Since the 1990s, Alachua County has experienced extreme weather events, hurricanes, historic floods, droughts and wildfires. Florida’s climate is predicted to experience greater extremes in weather conditions, temperatures and water levels. The critical relationship between GI and local capacity for climate change mitigation and adaption is becoming clearer. In response, a citizen’s initiative to bolster GI efforts received landslide approval in the 2000 General Election. A property tax increase was approved for a new conservation land acquisition program, Alachua County Forever. The momentum was maintained by new Comprehensive Plan and code provisions that strengthened our investment in GI. Through Alachua County Forever (ACF), we acquired and manage environmentally significant lands, protecting water resources, wildlife habitats and provide natural areas suitable for resource‐based recreation. Lands are nominated by the public, evaluated by staff and acquired through a voluntarily-negotiated transaction. One objective was to conserve the most ecologically valuable lands. The average of the acquisition list is above 7.00 (on a scale of 2 – 10, 10 being highest quality). The average of the more than 23,400 acres of lands acquired is over 7.6 and we have protected eight of the top 10 nominations. Leveraging the local investment was another objective. Two-thirds of the $104 million cost of the protected lands has been leveraged from state and federal granting programs, acquiring lands jointly with regional Water Management Districts and nonprofits, using mitigation funds and facilitating donations of land and cash. Partner agencies and nonprofits manage half of the acreage acquired through cooperative agreements. The referendum allowed for a 10 percent set-aside for initial capital improvements, creating funds for enhancing public access to the portfolio. Operating revenue is supplied through the annual appropriations process. Citizens are actively involved in the process: from pushing the initiative, nominating properties for purchase, serving on the Land Conservation Board (LCB) or as our volunteer conservation corps. Florida law requires an update to local comprehensive land use plans every 7 to 10 years. The state encourages deference to community vision, values, policies and practices. Our updated Plan includes a “greenprint” for establishing a comprehensive GI portfolio in conjunction with a blueprint for land development and conventional infrastructure. Specific policies are included that require or incentivize the establishment of GI assets on public and private property. The Plan requires developers to begin their design with deference to GI, instead of as an afterthought. Updating the Plan was not without controversy, ultimately requiring a negotiated settlement agreement to resolve conflicts among agricultural, environmental and development interests. The Plan identifies protected conservation resources: wetlands, surface waters, floodplains, listed‐species habitat, significant geologic features and the highest category of protection, “strategic ecosystems.” The 47 mapped strategic ecosystems contain the most significant upland and wetland natural communities remaining in private ownership. Large scale developments in strategic ecosystems must go through a special planning process that demonstrates the continued functioning of the ecosystem. The Land Development Regulations provide standards for preserving GI assets located on private property including a minimum of 20 percent set-aside for all proposals. Conservation resources are identified during the development review process and development activities must be conducted in accordance with protective standards. This objective is accomplished through consensus‐based, interdisciplinary approval processes. Minimum standards for these systems include protection of all wetlands and surface waters, protection of at least 50 percent of all uplands within the strategic ecosystems, conservation easements, management plans and environmentally-friendly designs. Development rights are preserved by either increasing densities on non-conservation areas or by transfer of development rights to other properties. Conservation areas are maintained in perpetuity by the developer under a conservation‐management plan and easement. 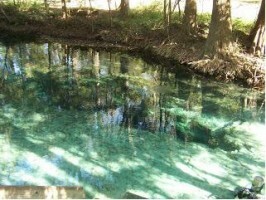 Alachua County promotes low impact design practices which help reduce water pollution and increase GI. For zoning and land use, gross density is used instead of lot size requirements, therefore giving more flexibility in design and allowing higher densities where appropriate. Flexibility in road width is provided and options for more water‐friendly drainage such as vegetated swales instead of paved curbs and gutters for residential streets. Plan incentives allow developers to use GI as more effective stormwater treatment and management. Stormwater facilities can count for up to 50 percent of the open space of residential development and 100 percent of commercial development. To obtain this credit, the stormwater facility must be “enhanced” to qualify as GI by incorporating biological diversity and water quality treatments beyond minimum regulations. GI design standards for stormwater facilities include staged elevations and littoral area, forebays, interpretive signs, trails and increased numbers and diversity of plantings within the basins. Since 2006, a total of 3,917 acres were approved for development in 139 projects with 443 acres (11 percent) of total impervious area and 1,524 acres (39 percent) set aside as GI (natural areas, conservation areas and other open space, such as community green spaces and landscaped areas). Conservation areas made up 825 acres (54 percent) of the GI set aside including the protection of 292 acres of wetlands and buffers, 377 acres of strategic ecosystem and 232 acres of listed species habitat. Through these two approaches, Alachua County has protected an impressive portfolio of GI assets that will contribute to our community’s quality of life for many years to come. Authors: Chris Bird has served as the Director of the Alachua County (FL) Environmental Protection Department (ACEPD) since November 1993. ACEPD is a county environmental protection agency that protects conservation lands, provides regulatory and non-regulatory programs related to pollution prevention, hazardous materials, and review of land development proposals for environmental impacts. Ramesh Buch has served as ACEPD’s Land Conservation Division Supervisor since 2001. Stephen Hofstetter has served as ACEPD’s Natural Resources Division Supervisor since 2003.